Business intelligence is a service that is crucial to both big and small companies. Indicee is a startup that that helps users easily combine data from their business applications and generate reports using Indicee’s cloud-based service. It essentially wants to bring bring reporting and analysis to the “masses” with a cost-effective solution to mashup business data. Indicee also just completed a $6 million Series A round from Granite Ventures and Yaletown Ventures. Indicee’s technology taps into data from business applications and content from productivity software such as Excel, and others and automatically builds reports and analysis for this data in the cloud. Users can ask business questions in plain English, which Indicee then responds with reports and visualizations that are produced from on-demand from data uploaded to the cloud. Indicee users also share data securely with colleagues or associates in an online community/social exchange. The software was recently released to beta testers, including Mary Kay Cosmetics, Alco Ventures and Sage Software. The beauty of Indicee is that it can draw data from a variety of reports and applications and mash it up to be shared with others easily. Indicee was co-founded by Mark Cunningham, who also developed Crystal Reports, which was acquired by Seagate in 2006. 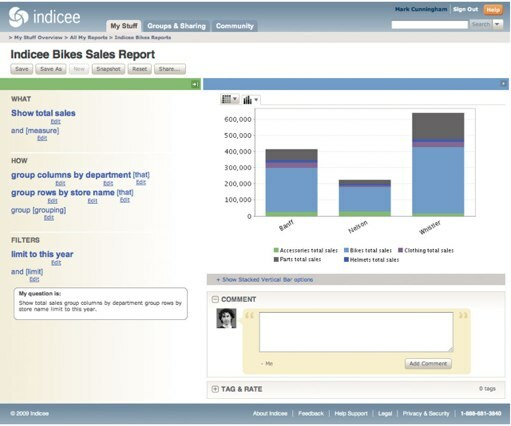 Indicee faces competition from others in the business intelligence space, including SAP BusinessObjects and Good Data.